The painting was originally commissioned by Alessandro Vittrice in 1601, and completed by two years later. It is now in the Vatican Pinacoteca (a copy is in the chapel). Three out of five of the altarpieces that he delivered between 1602 and 1606 were either rejected outright or soon taken down. Only the Entombment for the Vittrice Chapel in the Chiesa Nuova and the Madonna of Loreto (or Madonna of the Pilgrims, 1604-1605; Rome, S Agostino) prospered, both destined to become highly popular devotional works, not least with the poor. 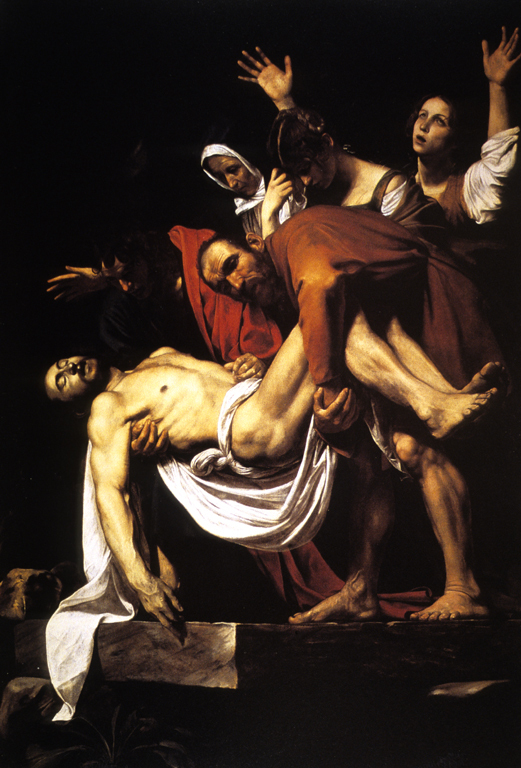 In the public commission of the Entombment, the outstretched arms of the Virgin double as a protective gesture and an allusion to the crucifixion, while the raised arms of Mary Cleophas incorporate a climax to the mourners’ grief and hint at Christ’s future resurrection. The quality of ritualistic mime that Caravaggio thereby brings to his gripping tableaux vivants has much in common with the modern theatre. 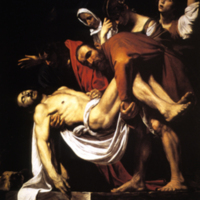 Michelangelo Merisi da Caravaggio (Italian painter, 1571-1610), “Entombment of Christ,” Institute Images Online, accessed April 24, 2019, http://westerncivart.com/items/show/2779.